Colour (ok, color then) is great, but too much of it and to quote my daughter it can look 'like a clown exploded'! Having said that it's sad how much of the stuff in the shops is dull dull dull. I think the secret is to pick colours that work together. Looks great Nadine. I know it can take a lot of trial and error when it comes to developing a style, and that's great that you're enjoying it, regardless of any unintended comments from a checkout clerk. I have found that my feminine style has helped my male side. While building up my Katie wardrobe, I am learning how to use certain colors to build an outfit. This has helped me with my male side, moving away from the dark colors I was so used to and using some bold colors for contrast. Good to hear from you Katie, hope you are well. Some how I think you would look nice in any outfit. Love how you and your wife describe each other in your links. You are truly a special couple. And campers and bird hunters. How incredibly nice and complementary. Thank you so much! I cannot speak for others but it does make sense to me that 'your clothes are becoming your clothes'. I know that there are more items in my feminine wardrobe that I have a true attachment or affinity for than in my male wardrobe. At the same time both wardrobes are filled with items that are classic and classy. Nothing all too trendy. Thanks for the thoughts Pat. I am very happy that my clothes are becoming truly "my clothes." 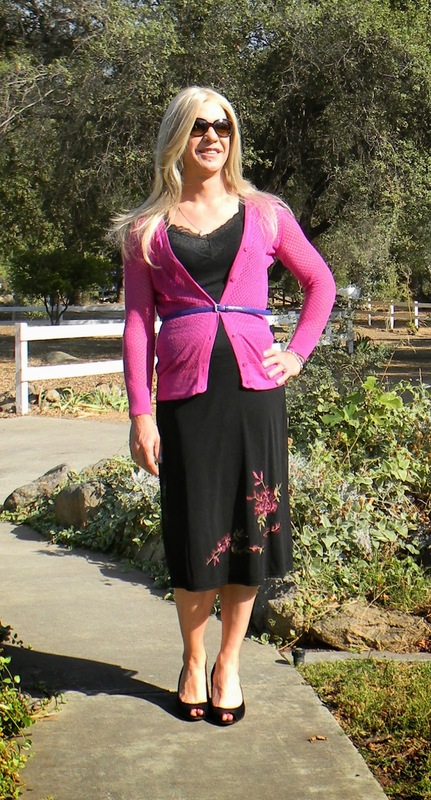 I look back and kind of think that my previous female clothes were just sort of a shell. A kind of fake version of what I thought a woman should wear, not necessarily what I, as a woman, would want to wear. Weird, interesting, and fabulous! I love the freedoms I have given myself to figure this all out, I am so much happier!